His Highness Sheikh Mohammed bin Rashid Al Maktoum, Vice-President and Prime Minister of the UAE and Ruler of Dubai, generously offered his private plane, a B747, to deliver, in the coming days, much needed humanitarian assistance to those most affected by the natural disaster in Mozambique. 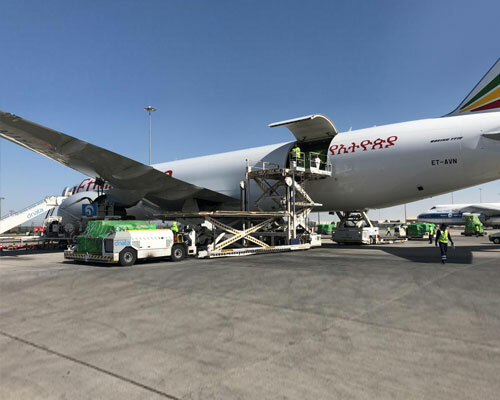 Meanwhile, the International Humanitarian City is supporting its partners and together they are working to provide life-saving relief to more than 400,000 people; A 97-metric-tonne shipment of humanitarian aid sent by members of Dubai’s International Humanitarian City arrived at Maputo International Airport yesterday. The aircraft from the IHC was loaded with medicine, telecommunications equipment, tents, and shelter toolkits and took off from Dubai early Tuesday morning. The airlift was arranged by the IHC to support the United Nations Humanitarian Response Depot (UNHRD), a logistics consortium of UN agencies and NGOs involved in relief and development. The operation cost, including transportation, upwards USD 548,000, and the IHC supported it from its Emergency Fund. The relief items came from stocks maintained at the IHC in Dubai by the World Food Programme’s (WFP) telecommunications and coordination support services team (FITTEST), the World Health Organization (WHO), Save the Children, Catholic Relief Services (CRS), the Swedish Agency for Development and Cooperation, and the Adventist Development and Relief Agency (ADRA). The critically needed supplies are destined for the coastal city of Beira, Mozambique’s fourth largest city which was battered severely by the cyclone Idai last Thursday night. According to aid officials and relief agencies on the ground, 90 percent of Beira, a city of some half a million people, and its neighboring areas have been destroyed. There are confirmed reports that tropical storm Idai has claimed the lives of over 200 people in Mozambique, Zimbabwe, and Malawi, with the death count rising. Falling trees and debris from buildings have also injured many thousands. Mozambique President Filipe Nyusi has estimated that up to 1000 Mozambicans may have lost their lives in the violent tropical storm.